Business for Healthcare Providers You Need A Plan To Market Your Healthcare Practice! 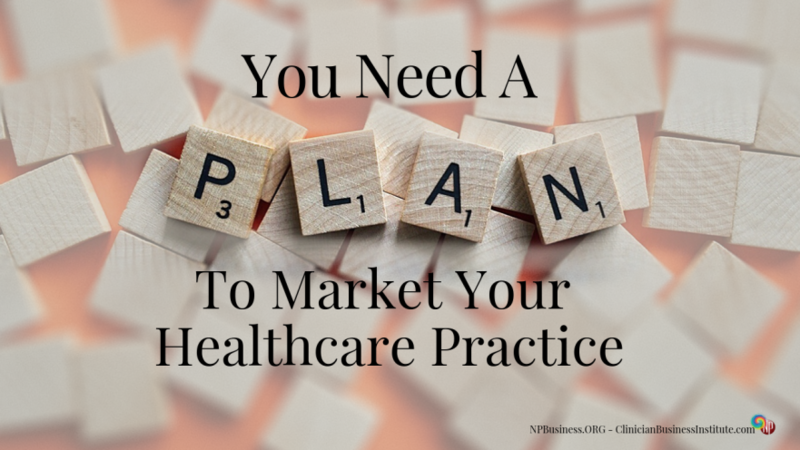 You Need A Plan To Market Your Healthcare Practice! Unlike the movie, starting a business doesn’t guarantee people will flock to it, or even find it. What you must do is climb to the top of the highest mountain and, megaphone on lips, announce your business to the world. I know, I’m exaggerating… But doesn’t it feel like that’s what it takes to get the word out? It takes a lot to be noticed and heard today! All the noise requires careful planning just to get your business on your customer’s radar. And that’s where your marketing plan enters the stage. While your business plan is your overall roadmap, the marketing plan deals with all aspects of marketing alone. The document may be part of the business plan, or it may stand on its own. But regardless, it details everything from analyzing your market, your products, services, to the strategies that will help you reach your goals. A clear marketing plan helps you maximize your marketing efforts so that you can make the most of your resources. What’s Goes In The Marketing Plan? There are a few key elements common to most marketing plans; here’s are the major components. Analyzing your market reveals who your customers are, what their needs are, and where you can find them. Beyond that, it tells you who your competitors are, what they do, and how you can differentiate your office from theirs. Always try to give your patients a reason to see you over the office down the street! To effectively market your practice, you must know who your customers are. And even though you may operate a primary care practice, serving a broad patient base, it’s still beneficial to fine tune your marketing messages to your ideal customer, rather than crafting general and generic messages. Unless you identify who your patients are, it will be difficult at best to attract them to your practice. Your plan must include clear goals. While your marketing goals are a subset of your bigger goals, they must always be in support of your overall business goals. If you don’t utilize the SMART framework, or one similar to it, chances are most of your goals will remain dreams. Once you’ve decided on your goals, use them to determine what you must do to accomplish them. What strategy do you need to follow; what steps must you take to make them come true? What is a marketing mix? And why do you, as a small practice owner need to worry about it? The marketing mix consists of a group of factors considered when offering products and services to consumers. From the marketer’s point of view, they include the product, the price, the promotion, and the place. You examine the product or the service: is it right for you? Is it what you’ve been looking for? Might there be a better option available somewhere else? You consider the sales price: do you feel the price is right and there is a fair exchange of price to value? Is there promotional material to introduce you to the product or help answer outstanding questions? Perhaps you have additional questions, or you need more information before you’re ready to make a purchase? Where can you find a particular product? In a store, catalog, or online? Once you make the purchase how can you get access to the product? Do have to pick it up from the store, will it be shipped, or is it available for download? All this and more goes into evaluating the purchase of most products and services. And the same happens on the marketing side of things. It would be foolish to talk about individual parts, such as product or price, without addressing the entire package. What hours would my patients prefer? Evening hours, weekend hours? House calls? How is my service different from the office down the street? How can I deliver unique benefits? What are the rates of my competitors? For a cash practice, how do patients feel about my rates? Do patients feel there is an equal exchange of value to price? How would raising rates affect my practice? How can I offer even more value to my patients? Are there practices in my area that offer the identical service? How many offices within a certain radius offer similar services? Do they accept new patients? How long is their waitlist? How accessible is my office to my customers? How easy is it to find my office? Is there adequate signage? How can I best reach my patients: with my website, through social media, newspaper ads? How do other offices promote their practice and their services? How could I adapt such promotions to my office? How can I promote my office, so it’s different from my competitors? Use the above questions to get ideas and to help you formulate your own marketing mix to include in your marketing plan. The final component of the marketing plan is establishing a budget to track the costs of marketing your practice. But before you can create the budget, you must know what marketing activities you plan to implement and what resources you’ll need. Once you know that, put a dollar figure next to each item. Consider how much you will need to allocate to each marketing activity. No matter if you plan to advertise online or offline, there will be some cost related to it. Decide how much you will spend on marketing your practice, at start-up and ongoing. Remember, you don’t have to use multiple marketing channels. Focus on where you can reach your audience! You must be willing to spend time researching your market, your competitors, and the various promotional methods available to you. The data you’ll gather is the fuel that drives your marketing. For without it, you’d be shooting from the hip at best. And remember, you don’t have to implement everything, all marketing strategies. Pick one or two things that resonate with you. Do them well and consistently, and you will get results! Do you see why you need a plan to market your practice? We’d love to hear from you… Tell us what you think and share your best marketing tips with us!